The TTRS program can be adapted in a number of different ways to accommodate the specific physical needs of a student, making the course as accessible as possible. 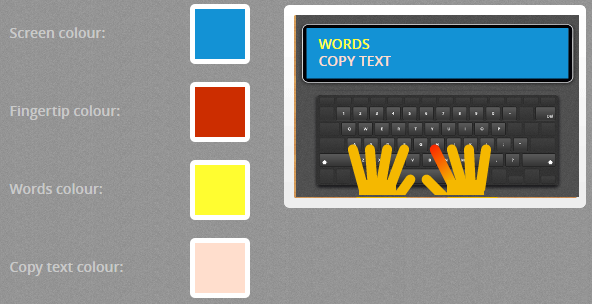 Within the Settings option, the TTRS program allows for changes to the Screen, Fingertip, Words and Copy text colours. These can be used to help ease visual stress and to provide the colour contrast required for those wearing tinted glasses. The Settings area also provides the student with a number of font options for ease of reading. Both the keyboard and hand colours can be independently set to either light or dark to provide additional colour contrasting. Students can choose from a UK Male or UK Female voice within the Settings area, for use with the UK spelling word lists. If selected, the USA Male voice will automatically initiate the US spelling word lists.